In 2009, the forces of pop culture converged to make a live-action G.I. Joe film and also an ultra-gritty, super-violent retelling of the original animated series called G.I. Joe Resolute. Fans went nuts for these exciting adventures, but very few figures were made based on them… until now! Enjoy 14 amazing 3 3/4-inch scale warriors in two packs. 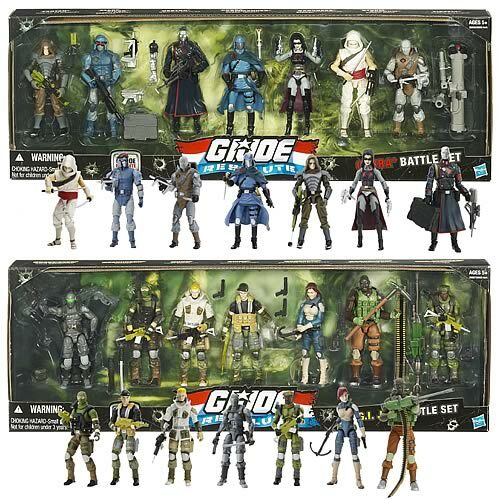 Team Cobra includes an Alley Viper, Baroness, Cobra Commander, Destro, Firefly, Storm Shadow, and Zartan. 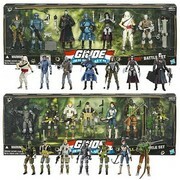 The Joes feature Beachhead, Duke, Flint, Roadblock, Scarlett, Snake Eyes, and Stalker. Collect them all, and be sure to check the inside of the boxes for collectible file cards!